Chinese starjasmine (Luoshiteng)-Trachelospermum jasminoides (Lindl.) Lem. Part Used & Method for Pharmaceutical Preparations: The foliated stems are gathered in winter or spring, cleaned, dried in the sun and cut into small pieces. The raw stems can be steamed with yellow wine. 1. Wind-damp obstruction syndrome manifested as rheumatic pain, spasm of the muscles and contraction of tendons. 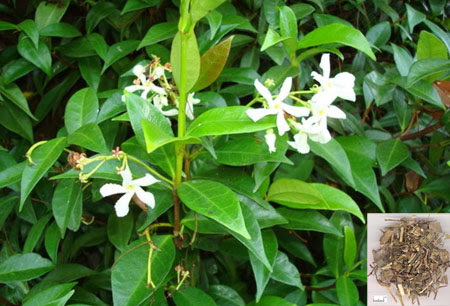 Chinese starjasmine (Luoshiteng) is used with Acanthopanax bark (Wujiapi) and Cyathula root (Niuxi). 2. Sore throat and abscess. Chinese starjasmine (Luoshiteng) is used with Honeylocust thorn (Zaojiaoci), Trichosanthes fruit (Gualou), Frankincense (Ruxiang) and Myrrh (Moyao) in the formula Zitong Linbao San.